Do you want to listen to your music collection from anywhere? There are dozens of music storage sites sometimes referred to as music lockers which provide excellent for organizing and storing all your songs online so you can get access to them wherever you are. Moving music to a cloud-based storage is a modern solution nowadays. Amazon Cloud Player, Google Play Music, and even the common clouds like Dropbox, there are so many of them that it might sometimes be difficult the choose the one that will meet all your needs. For the music admirers, who want to get some free space on their devices and transfer their music into the cloud, the quality matters the most. And while picking one of the cloud services, you should know that they might downgrade music quality. These cloud services can also limit the amounts of storage you can use and charge accordingly. However, the times of all these concerns may be gone forever once you try VOX Music Cloud Storage – an unlimited music cloud storage (previously called LOOP). VOX Cloud is part of VOX Premium subscription and is available on Mac, iPhone and Apple Watch, however, using VOX Cloud requires VOX Music Player. What is VOX Music Player? VOX is an excellent music player for Mac which plays file formats not supported by iTunes or iPhone’s native player. The layer was created specifically for audiophiles and thanks to the enhanced Bass technology the quality of the sound is outstanding, and the number of formats supported is fairly impressive (FLAC, ALAC, MP3, WMA, and APE, etc.) Regarding features, it has everything you could every ask from a music player – playlists, equalizer with presets, AirPlay, an internet radio (available via an in-app purchase), a plenty of preferences for adjusting the playback, etc. To put it in a nutshell, Vox is a music player and a music player alone. You can’t buy songs from within the app, or stream music like on Spotify. What you can do is to enjoy music playback from an app with a smooth, and easy to understand interface. You can play your Hi-Res files both on your iPhone or Mac. You can use either the Mac or iPhone apps to arrange your music library inside VOX Cloud as well. It is possible to play music from VOX with Sonos audio devices, which is by far the best audio speakers to fully experience Hi-Res sound. So why choose VOX if there are so many music players? It lets you synchronize all your tracks between your Mac and iPhone. You can sync as many files as you wish and get access to them anytime and anywhere you want. One VOX Premium Account can be shared among five devices. It is enough even if you have an entire Apple devices collection. It supports a broad array of music formats. You may upload your FLAC, WAV or APE files alongside MP3, OGG or any other lossy format. However, we heartily recommend, if possible, give your preference to lossless music. The times of conversion is already is the past and VOX Cloud played a great deal in it. The playback is astounding, that's for sure. Why? Just because both VOX music player and VOX Online Music Storage were created for audiophiles by audiophiles and it means that the prime focus was the quality of the playback. To start using VOX Cloud, you need to sign up for a trial period, then install VOX Player for Mac and iPhone to sync music between them and listen to it on the devices. Once you created a VOX Premium account, it automatically connects to your VOX player and whatever you upload to VOX Cloud appears in all your VOX players. If you know for a fact you won't be having any Internet soon, you can always cache a particular song or album. No more need to worry about your files as online music storage is way safer than storing on a phone, NAS or any other cloud service alternative. Luckily, developers at Coppertino have come to a conclusion that storing Hi-Res music on a device is relatively inconvenient and somewhat old-fashioned. 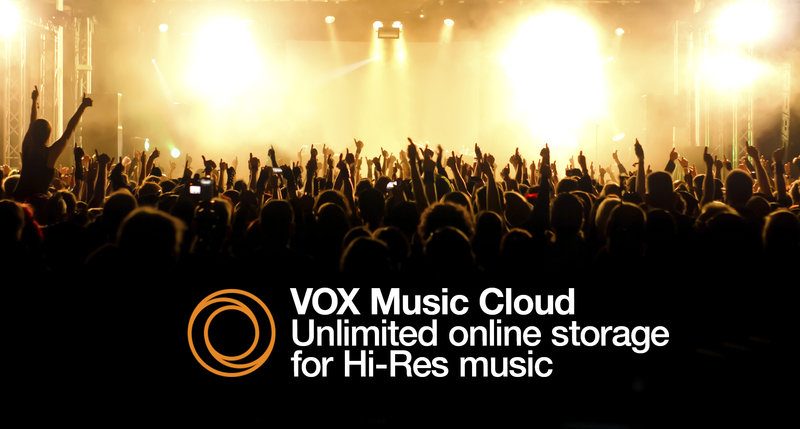 It’s the era of online music storages, and VOX Music Cloud Storage is the answer to our prayer. Now that we don’t bother about the space of our devices and risk of compression, we can relax and enjoy what musician record in studios. The quality of the sound is fantastic, and each melody makes you believe artist are singing right next to you.